To discuss this blog, or give feedback on the launcher changes, head on over to the comments thread on the official forums. Greetings capsuleers and welcome to the first Launcher Dev Blog in a while! We have some launcher updates scheduled in the coming weeks that we wanted to share with you, and would really appreciate it if you could try out the new beta and share your feedback with us. The biggest change to the launcher is a completely new layout, as such in this update we will be auto-resizing to the default layout. With this layout, users can now scale the window to best fit their needs by simply dragging the edge of the window and expanding or shrinking the launcher. 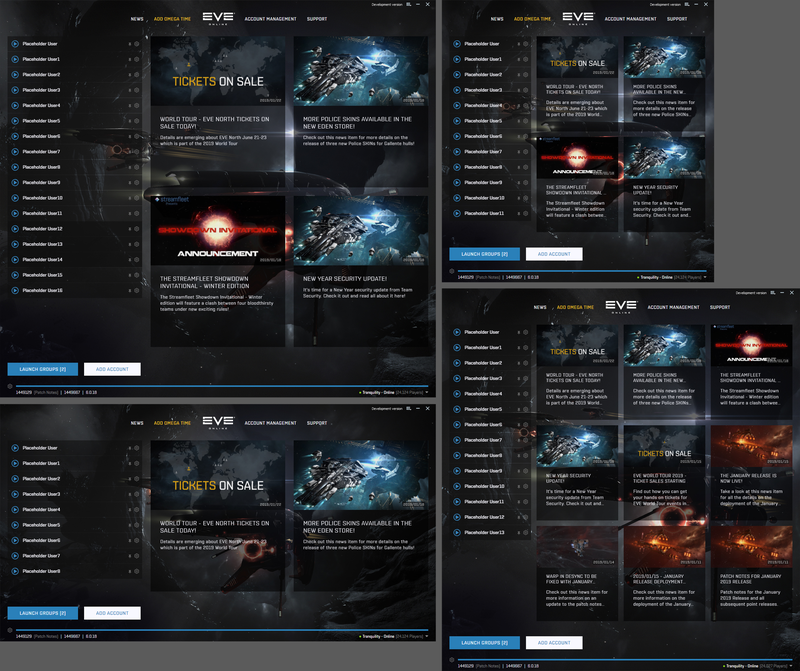 With this update to the launcher we have overhauled the authentication process, reducing possible points of failure for login - and refreshing your information - by dropping a service that for a long time was required to handle communication between the launcher application and EVE authentication service (SSO). Aside from streamlining the authentication process, there are a handful of extra changes we are making to hopefully make the launcher a little better for everyone. 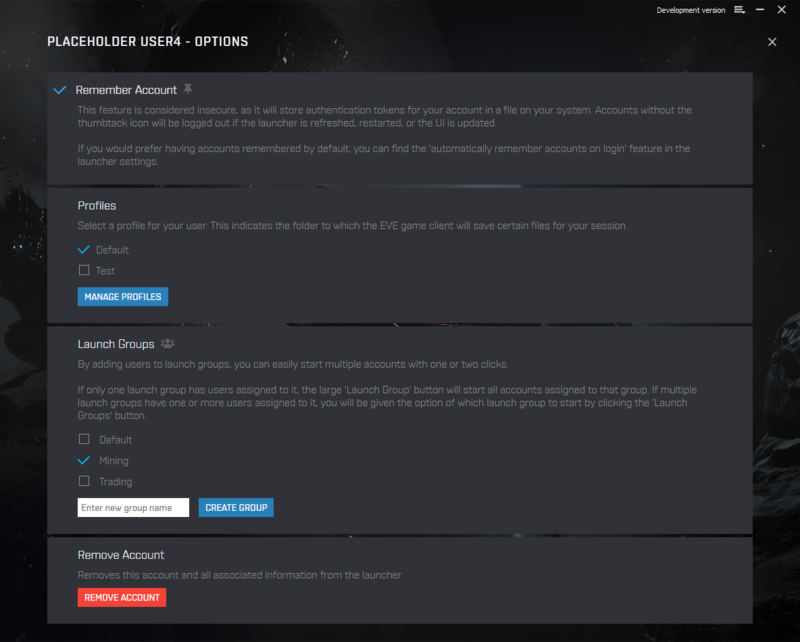 With the launcher update, we are getting rid of the toggle for starting multiple accounts and introducing "Launch Groups". With this feature you will be able to assign accounts to your own custom launch groups, in turn allowing you to launch the accounts you desire for the activities you want to participate in. Accounts can be assigned to many launch groups and you can have as many launch groups as you need. 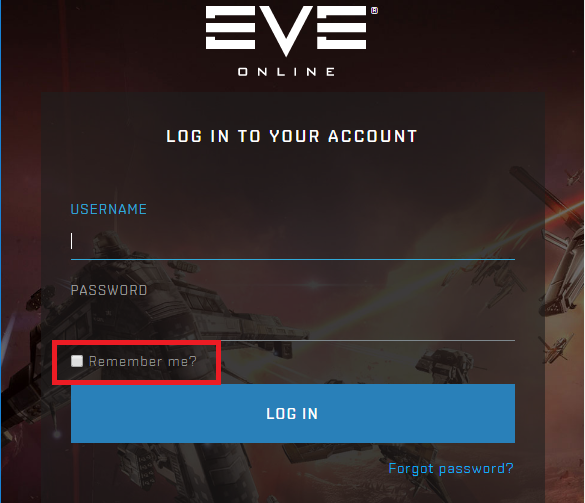 Since changing from the iframe that was used for logging in, to the current pop out window, one of the big features people have been requesting back is the “Remember Me” checkbox. We have added this back to the login window. 1) The "Remember Me?" option that is displayed at the login page. 3) Enabling the "Automatically remember accounts after login" option in the Launcher settings menu. This option, while enabled, will result in the account being remembered, even if the checkbox in the first option we mentioned here is not checked. If you decide that you no longer want the launcher to remember your accounts, you can either remove individual accounts from the Account Settings menu, or take the Nuclear option and use the "Forget All Accounts" option in the Launcher Settings menu. We would also like to clarify that the thumbtack icon is no longer a button, but when visible next to an account represents that "remember account" has been enabled for said account. The update will have a new option in Settings called “Enable launcher UI debug logs”. This adds lots of information to the log stream for the Launcher UI to help us investigate issues that may be encountered, however it has a drawback of being more resource intensive. We are asking that you only enable this option if requested for extra information on bug reports or support tickets. There will also be a handful of defect fixes with the update, including a fix for the defect where the launcher does not update without a restart. After the update, the launcher should update to the latest deployed client without any need to restart. Great! When can I try it out? Click the “E” in the top right of the launcher (marked red). Click the “Settings” option in the menu that appears (marked green). A window will appear, as shown above. Switch to the beta option in the dropdown (marked orange). Click OK to return to the launcher (marked blue). 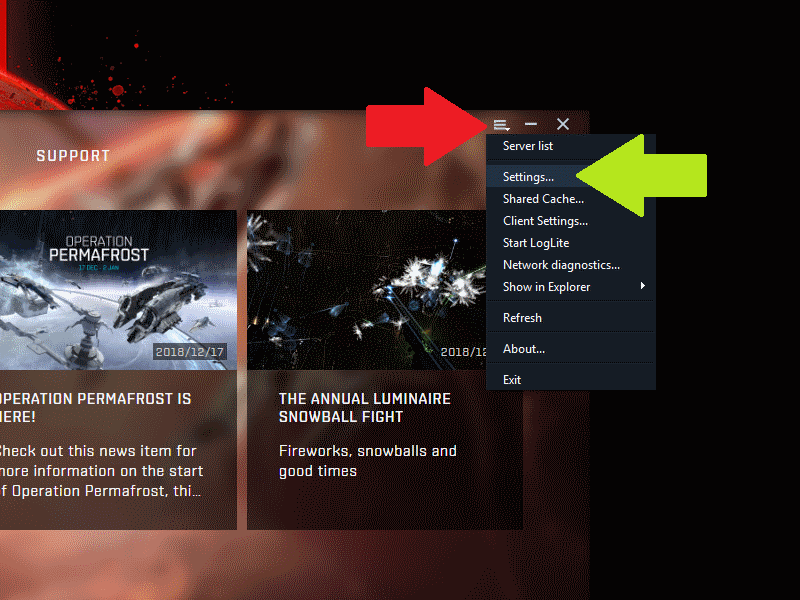 This will switch you to the beta build of the launcher. Now simply click the update option on the left of the launcher (pictured below), to update to the new beta launcher. 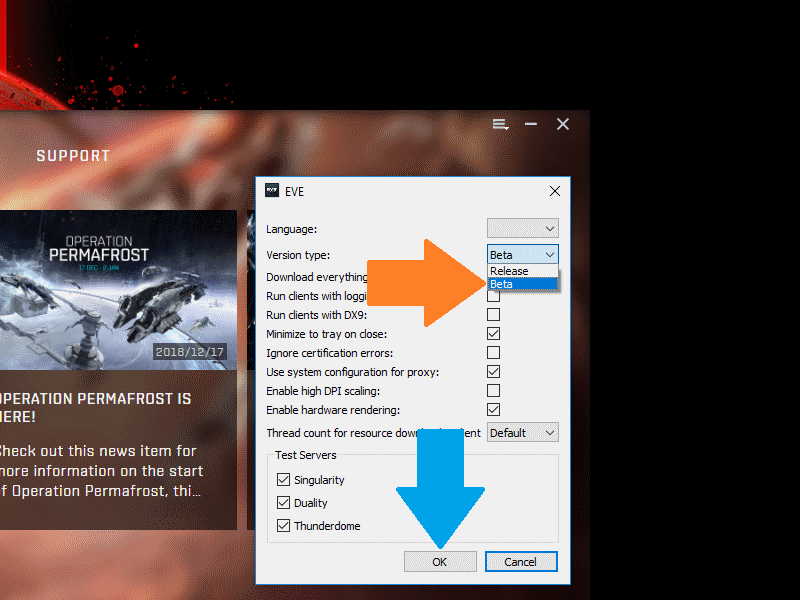 If at any point you’d like to switch back to the release version of the launcher, you can do so by following the same steps above and selecting “release” from the dropdown. Do I have to relog all my accounts? When we update the Release branch of the launcher with the new code, we will migrate all accounts you have pinned over to the new launcher. If they are not pinned, we have nothing to migrate for you and you must log in anyway. For this release we've been taking onboard feedback to address known defects and improve the login experience, and we'd love to hear your thoughts on what we should focus on in future. Be sure to use the comments section of this blog, along with the CSM feedback forum to ensure your voice is heard, as we'll be meeting with the CSM when they visit in late February. 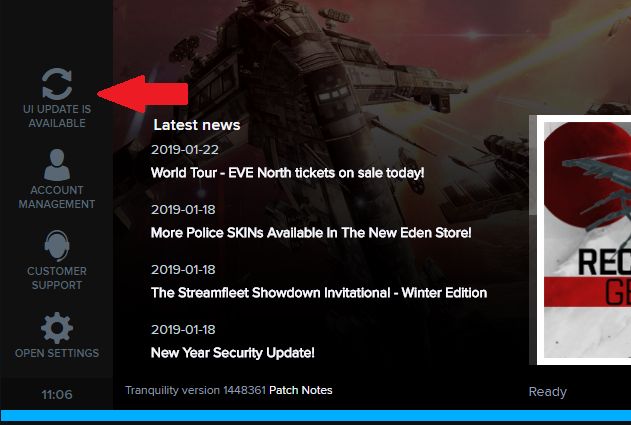 Thanks for taking the time to read up on the new launcher, we hope you'll enjoy the latest updates and we look forward to hearing your feedback.